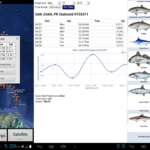 Caribbean tide tables play a major role in almost every aspect of fishing. REALTIME Satellite Map using NOAA tide charts of the entire Caribbean and Florida coastline marine tide tables using NOAA (National Oceanic and Atmospheric Administration) tide chart data on a simple to use satellite map. Bermuda, Bahamas, Cuba, Bahia de Cienfuegos, Jamaica, Haiti, Dominican Republic, Puerto Rico, Lesser Antilles, Virgin Islands, St. Croix Island, St. Thomas Island, St. Johns Island and the Florida coastline.